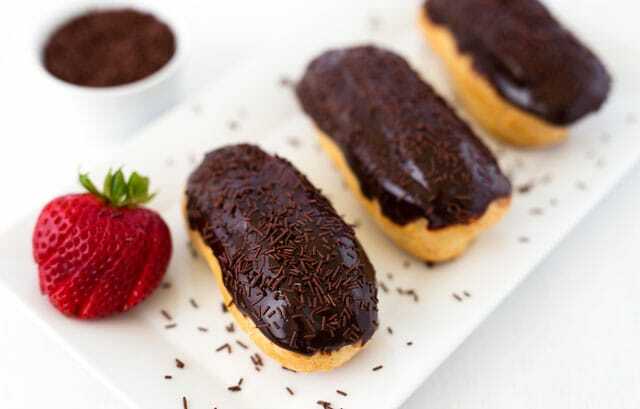 Chocolate Eclairs are made by filling a crisp, buttery eclair shell with a light, creamy vanilla pastry cream and glazing it with a rich, chocolate icing. Eclairs are one of my family’s favorite desserts. It’s a perfect combination. A crisp exterior surrounds a smooth, creamy, light as air custard and topped with a rich chocolate glaze – it’s heaven on a plate. 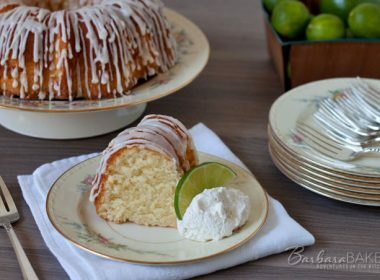 I bought an Accent Decorator from Pampered Chef recently and was anxious to try it out. So when I offered to make dessert for an upcoming get together, of course I decided to bring chocolate eclairs. 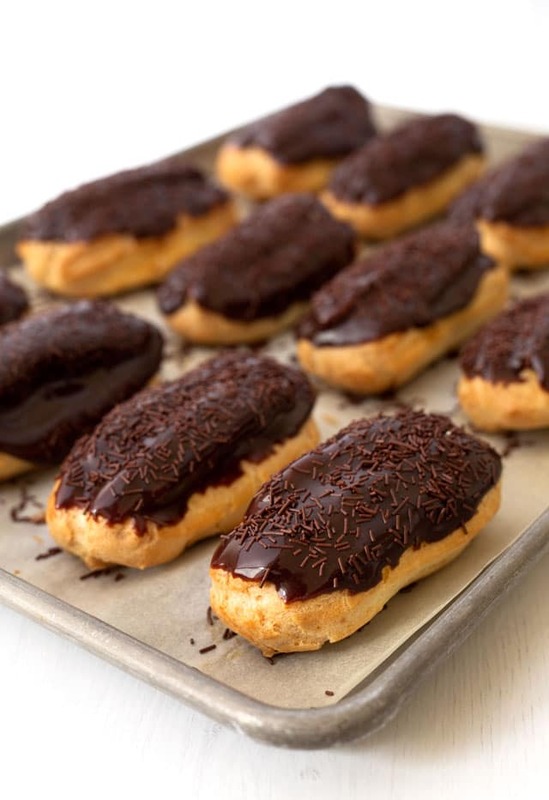 The decorator makes filling eclairs a breeze, but you can use a pastry bag as well. We love the eclairs at Schmidts, a local pastry shop, because their custard is a mix of vanilla pudding and whipped cream. So for my eclair filling I made my favorite homemade vanilla pudding and mixed it with whipped cream. Usually I use the Betty Crocker recipe for the choux pastry, but this time I tried a recipe from the Food Network and I liked it even better. 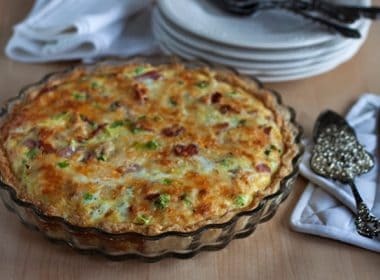 Instead of mixing the eggs into the dough in the saucepan, you put the dough into a mixing bowl before adding the eggs, which stops the cooking process and you don’t have to worry about working so quickly. Making eclairs at home can be a bit time consuming, but it isn’t difficult. If you haven’t tried it yet, it’s well worth the effort! Update: June 22 is National Chocolate Eclair Day, so I thought it was time to update this post with some nice new pictures. I remade the recipe as it was originally written. 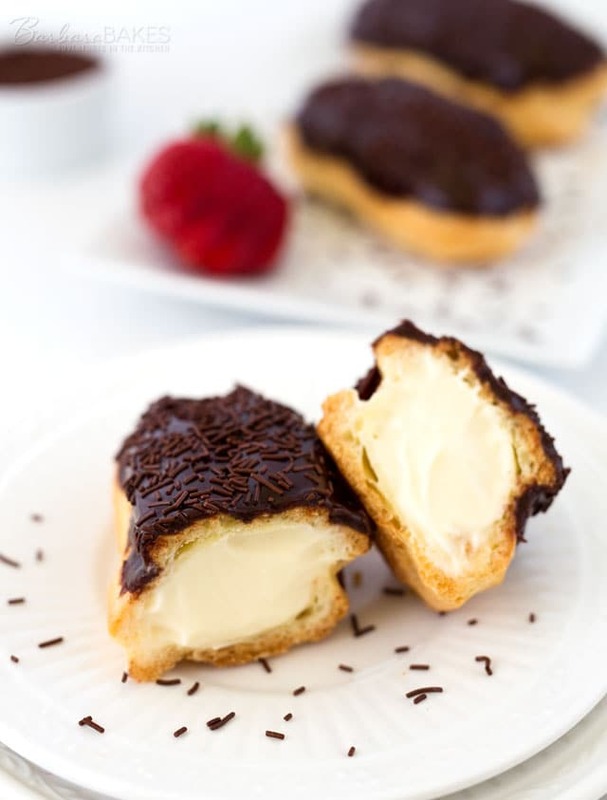 My upcoming cookbook, Dream Puffs, is all about cream puffs, eclairs and profiteroles. 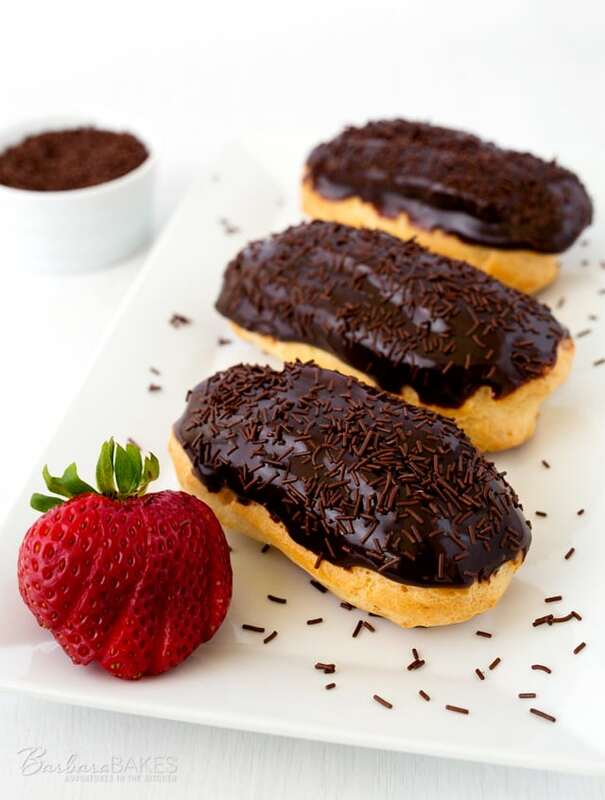 The Chocolate Eclair recipe in the cookbook is an improved version of this chocolate eclair recipe. I can’t wait to share it with you. 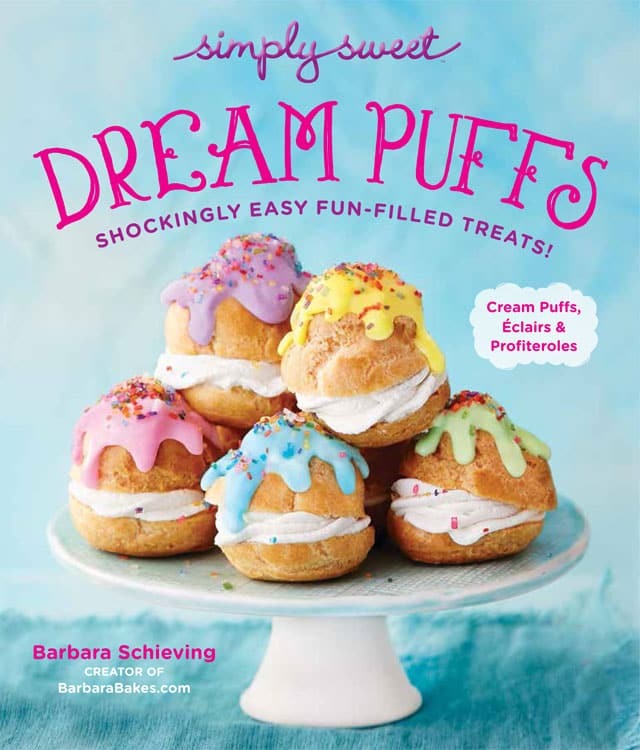 Simply Sweet Dream Puffs: Shockingly Easy Fun-Filled Treats! is available for pre-order on Amazon! In a saucepan combine the sugar, flour and salt. Gradually stir in milk gently. Cook over medium heat, stirring constantly, until mixture starts to boil. Cook for 2 minutes more. Remove from burner. Stir a small quantity of the hot mixture into the beaten egg yolks, and immediately add egg yolk mixture to the hot mixture in the saucepan. Cook for 2 more minutes, stirring constantly. Remove from heat and add butter and vanilla. Transfer pudding mixture to a medium bowl. Cover with plastic; refrigerate until well chilled, about 1 hour or overnight. When vanilla pudding is chilled, whip cream to form soft peaks and gentle fold in to vanilla pudding. Keep covered and chilled until ready to use. Preheat the oven to 425°. Line a sheet pan with parchment paper. In a large saucepan, bring the water, butter, salt and sugar to a boil over medium-high heat. Remove saucepan from heat. Add flour all at once. Stir until all the flour is moistened, about 1 minute. Return to heat and cook, stirring constantly, for another 1 to 2 minutes until dough forms a smooth ball. Scrape the mixture into a mixer fitted with a paddle attachment (or use a hand mixer). Mix at medium speed. With the mixer running, add 3 eggs, 1 egg at a time. Stop mixing after each addition to scrape down the sides of the bowl. Mix until the dough is smooth and glossy and the eggs are completely incorporated. The dough should be thick, but should fall slowly and steadily from the beaters when you lift them out of the bowl. If the dough is still clinging to the beaters, add the remaining 1 egg and mix until incorporated. Use your fingers to smooth out any bumps of points of dough that remain on the surface. Bake 15 minutes, then reduce the heat to 375° and bake until puffed up and light golden brown, about 25 minutes more. Try not to open the oven door too often during the baking. Let cool on the baking sheet. Place the chocolate chips, margarine, and corn syrup in small saucepan over low heat and stir until the chocolate and margarine melt, 2 minutes. Add the water, a teaspoon at a time, until the glaze is of a pouring consistency. 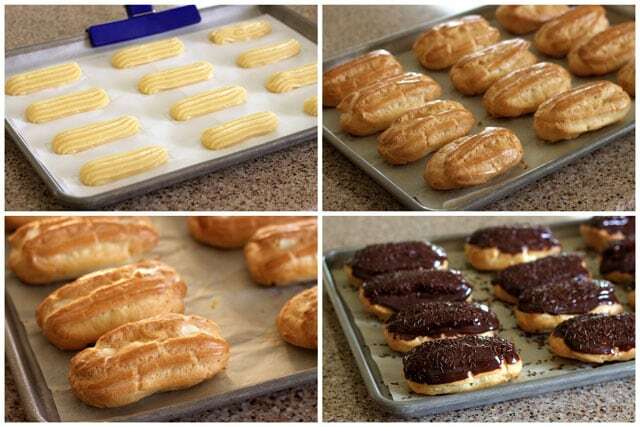 Dip the tops of the eclairs in the warm chocolate glaze (or spread on if that's easier) and set on a sheet pan. Chill, uncovered, at least 1 hour to set the glaze. Serve chilled. These were amazing!!! I made these for a Mother’s Day dinner with my family last night and everyone loved them! The only things I did differently are I used bread flour in the choux paste because I wanted more structure (to get the textural difference between the pastry and the cream), and I used half water half milk. I also piped cream puffs because they’re more bite sized and used 1 tsp vanilla in the pudding. Ohhh man. 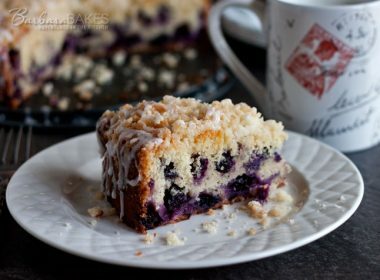 Every piece of this pastry is delectable. i’ll be making these again and again! Thank you so much for the recipe!! Thanks so much Katherine – your comment brightened my morning for sure. Glad they were a hit. I’ll often make littler ones for parties too. Thanks for sharing your changes. Delicious! I’ve made these twice this week. I loved the pastry cream although I added a little bit of powdered sugar to the whipping cream because I prefer a sweeter taste. Also the chocolate glaze was perfect! Thanks for a great recipe! I followed the recipe to a tee, and my pastry turned out hard when it came out of the oven. So bummed out. Hi Shelby – as long as they have a hole in the middle, they should be fine. They’ll soften after they’re filled for sure. Your eclairs look delicious. My hubby would eat them all in one sitting. 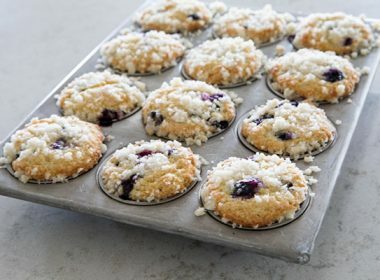 Like little bites of heaven! These eclairs are so beautiful Barbara! Wow! Can you make the pastry ahead and freeze until use? 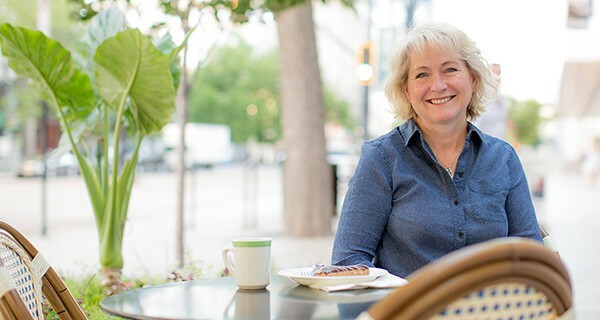 And then fill…..
Hi Carolyn – Yes, the pastry shells freeze and thaw very well. You can even pipe the dough on baking sheets and freeze the dough and then bake it the day you want to serve it, which is nice if you’re baking for a crowd and freezer space is limited. Bakery perfect, Barbara!!! You rocked these! 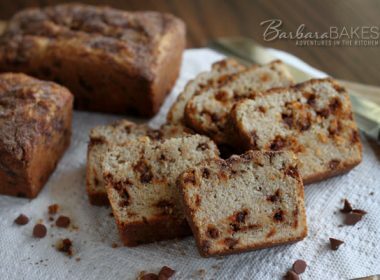 These look seriously beautiful, Barbara. Chocolate and cream heaven! these are delectable and devourable!! WOW. I love these! Donuts and Eclairs are my weakness…. I don’t know if I commented before….if so I’m gonna comment again….HOLY MOLY those look amazing! Bob loves cream puffs and eclairs so you know who’s gonna be getting your cookbook the minute it’s out. I don’t make cream puffs often enough according to my husband so your new book will give me MANY REASONS to change that. I’m a sucker for a big, creamy eclair….